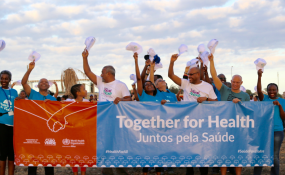 Leaders and policy makers, ministries of health and finance, inter-governmental agencies, the private sector, civil society organizations and members of the media are among many participants in the World Health Organization (WHO) Africa Health Forum, hosted by the Government of Cabo Verde and the WHO Africa Regional Office. allAfrica's Nontobeko Mlambo interviewed WHO Africa Regional Director Dr Matshidiso Moeti just before they both headed to Praia for the conference. This year's theme for the Africa Health Forum is Achieving Universal Health Coverage and Health Security: The Africa We Want to See - what do you think are the major factors holding back the continent? Overall, we see that the health system in many countries in the Africa region are not delivering or performing as well as they should in terms of their capacity to meet the priority health needs of the population. Universal Health Coverage's (UHC) ambition is to make sure that every citizen is covered by healthcare services that they need, to get priority health programs and essential health programs in a way that is affordable and in the fashion that is equitable - meaning despite their background, their socio-economic status. So, in most of our countries the key factor is under-investment in the health sector. WHO has set some capital spending that should be available for health in countries and although we have seen countries gradually increase what they were spending in the past 15 years, it is still low on what should be available. It's not just a matter of how much money, it's also how the money is invested that determines if the progress is there, that determines if the coverage of the majority of people is there. In quite a few of the countries a significant part of funding goes to hospitals, second level care and sometimes treasury care and what is then spent at the primary care is relatively little and does not fulfill the purpose. In addition to that we have in our region the highest proportion of people who pay for healthcare from out of their pockets, meaning they don't have an insurance scheme of any type and this quite often causes a crisis in households as families might need to borrow money, and it tips off right in to impoverishment because an already-high portion of their money is going in to the healthcare, meaning then that they might not have financial strategies and schemes that enable people to have pre-financing for health. The main factors holding back UHC are lack of funding, how money is invested, lack of financial protection for people so that then quite often they are not able to access services, they can't go because they don't have the money to see a doctor or see a nurse when they need to, and our region has the first proportion of people who are in the situation globally. Our countries should really address the financing of health, not only more money, how the money is spent, pulling of the resources to cross finance those who are not able to contribute even to insurance premiums and reduce out-of-pocket payments for people. We don't foresee that in terms of the availability of services, the human resources, having doctors, nurses, midwives, technicians available in countries. We see the biggest gaps in terms of the numbers, the population numbers of healthcare workers in countries, so again it's not only shortage in terms of logistics in many of our countries. The problem is that we are concentrated in cities, in towns and if you go to rural areas and villages the doctors are not present and quite often there are no qualified midwives in the numbers that are needed to have a good quality services available. Very often the people who are in the primary care in the rural areas, which tend to be nurses, face very heavy workloads and very difficult conditions of work Very often people are assigned or designated stations and spend a lot of time in the city negotiating not to be there, creating further jobs for the population. So to be healthcare workers is a big factor in our region and quite simply the countries need to train more people. As WHO we are urging countries to produce more healthcare workers. We also see in quite a few number of countries strikes by doctors, by nurses because they feel that their remuneration is not sufficient, they are not earning what they would consider a fair wage or the working conditions are difficult so countries have to juggle all of this in order to have a health workers that is sufficient. In order to know the system you need data, you need information, you need information to be documenting what is going on in order to provide good health services. We are seeing the reduction in particular health programs in the way that we are expecting based on what we have done and many of our countries don't have enough health information systems to have accurate tools that enable them to take the right action to improve the health system. For example when you need to estimate the proportion of the population for which you need to provide a service, we find that many countries struggle with finding out exactly the number of the people they are targeting because we have weak administration and registration. This all means we have systematic weaknesses that need more investment and also needs to be addressed in a strategic and structural way. UHC is all about people at the end of the day and many of our systems have been designed with a focus on people. We have the problem of HIV/Aids, maternal health, immunization and noncommunicable diseases in the continent. We are recommending that the gaps in interaction with communities and the healthcare system should be improved because if you have good mechanism in engaging people at a household level, then we can also have them play a more active role in looking after their own health, in behaviours and certain lifestyles that reduce risks of their getting diseases, and also be able to provide feedback to those who use the healthcare systems. In some countries they have community workers who bridge that gap but it's not that sufficient. If they are there, more often than not they are not on the payroll regularly so that link is inconsistent. How will countries make sure that all sectors including the private sector are on board for this goal to be achieved? Governments are becoming more and more aware of the importance of this partnering and working with the private sector in both financing and delivering health care, and luckily we are also seeing a different momentum on the form of the private sector in health care. I think this conference meeting is happening at a right time which is really interesting in terms of the opportunity of advisor by the private sector. We have seen examples of ways in which the private sector engages, of course we know already in some countries they provide health care, they run hospitals and clinics, they run different non-governmental organisations or missions. We are seeing in some countries the private sector is also investing in health insurance schemes, some working with governments, kind of investing in insurance schemes. There are a couple that are targeting low income households that I find very interesting because of the way of stretching the budget. They are also assisting households that aren't able to contribute themselves, and also many people in the informal sector where the employer can be involved in a health insurance scheme for its employees and the employee just contributes. The private sector is seeing an opportunity to invest and it is providing not only financing but also providing good quality and affordable life care services. Those are some of the ideas the private sector can engage in a way that's targeting universal health coverage, as I said, with an emphasis on equity meaning not just people who can pay some prescribed high fees. How should the progress Cabo Verde and Rwanda have made in achieving UHC be viewed by other countries? An example, a guideline of what to do? I think ultimately each country adapts whatever they have seen as experience, example or model to their own particular context so that it suits their situation and it can deliver for them. I think definitely the experience of countries that have managed to make progress is worth understanding, is worth analyzing and looking at the experiences of other countries. One of the thing that WHO does is to disseminate information about experiences, good practices that have been successful and indeed one of the purposes of the forum is to enable this exchange so I definitely think that we should be looking at Cabo Verde and Rwanda as examples. Other countries as well like Gabon have been addressing this work of establishing health finance models that are in the direction of universal health coverage for over a decade and have learned many lessons. Some have encountered difficulties that it's important for countries to look out for but I do think that the experience of each country is definitely worth studying, looking to see what one can take from that to adapt or to adopt in one's own country. Rwanda, for an example, their approach was to start with a decision to put as many people with health insurance starting with very limited range of incidents that were covered and they managed then to cover more than 90% of the citizens. Now, they are trying to expand the package, to find additional financing so that the range of services can be increased. In Rwanda most people have the basic insurance and you have to add payments to access health care and this is tiered in terms of premiums based on people's availability to pay. They will be able to use it to subtract some of the payments that are required in a smart way to also mobilize international funding and integrate it in to their prepaid health insurance scheme. At the moment I know that countries like Kenya, Benin, and Cameroon because I've been visiting the countries recently are in a process of designing their health financing scheme, including trying to look at how to cover those people who are in the informal sector, how to cover those from very low income households etc,and I think some of these experiences could be very informative for them to decide on their strategies. Gabon put a tax on mobile phone use and also mobile transfers of funding , all of these are really good lessons, so for me its very important to look at what other countries have done and learn from them.